One of the most popular ways to catch bass on Shasta Lake is using a darter head. What is a darter head? It is a hook with a weight attached directly, usually having a pointed head on the front end. You just attach the darter head directly to your line and slide on a plastic worm or creature bait and start fishing. The hook is normally exposed at the top of the plastic lure you are using. Darter heads come with many different weights and hooks, the popular weights are 1/16oz. to 3/8oz. My personal favorites are 1/8oz. and 1/4oz. When I'm fishing shallow or the fish are suspended, I use a 1/8oz. darter head for a slower fall rate. For deeper fish I prefer a 1/4oz. darter head. I prefer using the shortest hooks possible. I've used #4 hooks in a 1/8oz. darter head and #2 hooks in a 1/4oz. The smaller hooks allow a more erratic fall. 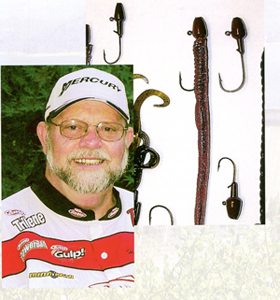 The longer hooks act like a keel and the baits slide. Darter heads with the small hooks are hard to find so #1 to 2/0 are more common. When fishing larger plastic baits such as Berkley Power Hawgs use a 2/0 hook. Some of my personal favorite plastics to use with the darter heads are 4" and 6" Berkley Power Finesse Worms, 4" Power Hawgs and Berkley 5" Power Shaky Worms. Mother's Finest also makes excellent worms for darter heads. Basic colors that work well are green pumpkin, watermelon, oxblood, clear and white. Darter heads are a finesse technique using small diameter fishing line and open face spinning reels, with medium to medium-fast spinning rods in 6'6" to 7' rods. With a lighter weight and smaller hook, use a medium action rod. With a heavier weight and larger hook, use a stiffer rod. Medium fast works well for me. My favorite line is 6 lb. or 8 lb. test Berkley Trilene 100% fluorocarbon, Trilene XL 6 lb. or 8 lb. test also works well. Where do we fish darter heads? Points are primary places to work darter heads. Bluffs, creek channels, river channels and shallow coves also work at different times. There are many ways to fish a darter head. Moving very slowly on the bottom works really well and shaking or doodling them in place can be very productive. I like to use this technique when I see them on my Lowrance Electronics. I drop my darter head vertically to the fish and shake it. I can actually see my darter head on my meters and often watch the bass go after the lure. When you see bass suspend on a bluff, go to a 1/16oz. or 1/8oz. darter head and slow fall through them. Just experiment with these techniques on your own. When the water is cold, fish slower. As it warms up, you may work them a little faster. - Put your worms and plastic baits on as straight as you can. - Buy (or make your own) painted heads (helpful, but not a necessity). - Darter heads have exposed hooks, so avoid places where they can be lost by timber, especially in the Pit Arm or mouth of Squaw Creek in low water years. Have a great time on Shasta Lake and give darter heads a good try. I'm confident darter heads will increase your chances to catch bass.